That´s right. I did not vaccinate my child, instead I decided to give her the best immunisation available for free: My Breast Milk. Nature designed it for us to have at least the first 6 months of life before any other liquid or food. It contains all the nutrients, vitamins, minerals and natural hormones and substances that our body requires to stay healthy and to go through any illness and fight with its own resources. Here are well documented reasons why I came to believe that health cannot come from a needle. 1. Ever wonder why doctors can’t find the cause for many diseases? It’s because they are conditioned to ignore the relationship between illness and vaccines. Allergies and eczema, Arthritis, Asthma, Autism… •	Acid reflux •	Cancer •	Diabetes (infant and childhood) •	Kidney disease •	Miscarriages •	Long list of neurological and autoimmune diseases •	Sudden Infant Death Syndrome (SIDS) • Seizures/epilepsy •	Severe allergic reactions, such as hives and anaphylaxis •	Sudden death •	Many common diagnoses given for hospital admissions. •	The National Vaccine Injury Compensation Program, (NVICP) has awarded more than $1.2 billion in damages to children and adults injured by vaccines. Autism is associated with vaccines. •	Autism was rare until the mass vaccination programs were accelerated in 1991, with the introduction of the hepatitis B vaccine and the HiB (meningitis) vaccine. Tens of thousands of parents will attest that autism appeared in their children very soon after they were given these, and other, vaccines. 2. Drug companies, insurance companies and the medical system get rich when you get sick. •	Vaccines do not give life‐long immunity, which means booster shots are recommended. •	Each booster shot increases the risk of more side effects. •	Vaccine side effects can make you sick for the rest of your life. Conveniently, there are many drugs to treat the side effects caused by vaccines. Many doctors and health‐care practitioners do not get vaccinated and do not vaccinate their children. Why not? •	They know vaccines are not proven to be safe or effective. •	They know vaccines contain dangerous substances. •	They know vaccines cause serious health problems. •	They have treated patients with serious side effects from vaccines. Drug companies have infiltrated and seized control over the entire healthcare system, including medical schools, medical journals, hospitals, clinics and the local pharmacy. A doctor’s very livelihood thus depends on blind faith, without questioning any aspect of any vaccination.Even when obvious evidence of vaccine damage occurs right before a doctor’s eyes, s/he is usually unwilling to consider a vaccine as the cause. Though uncorrupt science and medicine support rejection of vaccines, doing so can be considered professional career suicide. •	Hospitals benefit financially from hospitalizations and tests. •	Drug companies make billions of dollars from vaccines. •	Drug companies make tens of billions of dollars from drugs given to treat side effects and life‐time illnesses caused by vaccines. •	Vaccines are the backbone of the medical system. Without vaccines, healthcare costs would go down because we would have a healthier overall society. We have exchanged chicken pox for autism, flu for asthma, ear infections for diabetes. The list goes on and on. In the zeal to eliminate a short list of relatively benign microbes, we have traded temporary illnesses for pervasive, life‐long diseases, disorders, dysfunctions and disabilities. 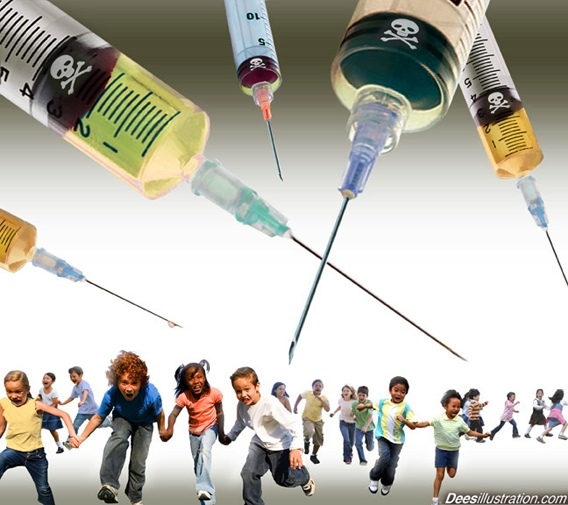 •	If U.S. children receive all doses of all vaccines, they are injected with up to 35 shots that contain 113 different kinds of disease particles, 59 different chemicals, four types of animal cells/DNA, human DNA from aborted fetal tissue and human albumin. •	If you think you don’t have to worry about vaccines because your children are older, think again. There are at least 20 more vaccines currently in the development pipeline for release in the next few years, mostly targeting adolescents and adults. 3. Some Vaccine Ingredients: How is it possible that vaccines will not be harmful to your health? •	Stray viruses and bacteria from the animal cell cultures that vaccines are made in. 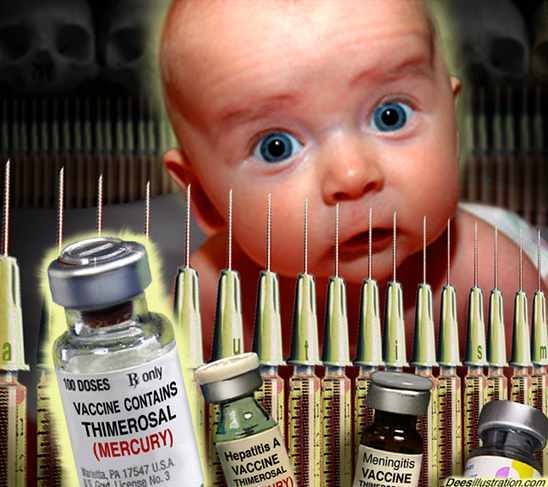 •	Mercury, a well‐documented neurotoxin, is still in the multi‐dose flu vaccines throughout the world. Traceamounts remain in several other vaccines. •	Aluminum, a poison that can cause bone, bone marrow and brain degeneration. •	Animal cells from monkeys, dog kidneys, chickens, cows, and humans. •	Formaldehyde (embalming fluid), a known carcinogen. •	Polysorbate 80, known to cause infertility in female mice and testicular atrophy in male mice. •	Gelatin, from pigs and cows, known to cause anaphylactic reactions, is found in large quantities in the MMR, chickenpox and shingles vaccines. •	Monosodium glutamate (MSG) in inhaled flu vaccines, is known to cause metabolic disturbances (e.g.diabetes), seizures and other neurologic disorders. •	The same people who make rules and recommendations about vaccination profit from vaccine sales. For example, Dr. Julie Gerberding, who was in charge of the CDC for eight years, is now the President of Merck Vaccines. Dr. Paul Offit, a member of the Advisory Committee on Immunization Practice(ACIP), developed and patented his own vaccine. •	According to the CDC, the average U.S. 10‐doctor pediatric group has over $100,000 of vaccine inventory in their office to sell. These doctors make money from office visits and from giving your children vaccines, and also from follow-up office visits for assessing reactions. •	U.S. pediatricians reportedly make quarterly bonuses from the HMOs they work for by maintaining high vaccination rates in their practices and have reportedly been reprimanded by insurance companies if their vaccination rates fall. •	Vaccinated children had 120% more asthma. 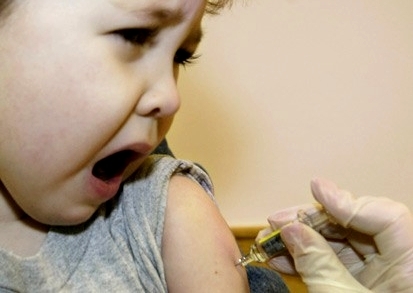 •	Vaccinated boys had 317% more ADHD. •	Vaccinated boys had 185% more neurologic disorders. •	Vaccinated boys had 146% more autism. Girls represented only 20% of the total number of children in the survey. •	Groups that generally do not vaccinate include holistic practitioners, chiropractors, parents who home school, and those who belong to certain religions. •	Thousands of testimonies written by parents of non‐vaccinated children about the state of their children’s robust health are available many places online. •	Vaccination decisions are between you and your spouse/partner. No one else needs to know. It is not the business of your family members, your neighbors, or your in‐laws. 5.To have vibrant health, you will need to take the initiative to learn some new things. •	The safe choice is to say no to vaccines. You have control over health choices you make for yourself and your children. You have no control over the outcome of a vaccination. •	You do not need a pediatrician to simply weigh and measure your child and give shots. Consider a naturopathic doctor, a pediatric chiropractor, a doctor of oriental medicine, or a homeopathic doctor. You may find that family doctors of osteopathic medicine are more open‐minded about vaccine‐free choices. •	Babies are born with powerful, natural defenses. If this were not so, all would die shortly after birth. Enormous cascades of complex immune processes start with the first cry. This needs to occur naturally, without the interruption caused by the injections of toxic substances. •	Learn about the “vaccine preventable” diseases. Your children will never come in contact with most of them and if they do, nearly all healthy and unvaccinated children recover uneventfully, with long-term immunity. •	Understand that your child can be vaccinated and still contract the illness you are wishing to prevent. Vaccines may not provide the protection that people assume they do. Health cannot come through a needle. •	Learn that the primary keys to health are good nutrition, pure water, adequate sleep, routine exercise and happiness. •	Learn some simple information about vitamins, especially the critically important information about vitamin D3. Learn how to use basic herbs and basic homeopathy for health and for addressing minor illnesses. •	Learn more than your doctor about vaccines. Your medical doctor has probably never read anything about vaccines except drug‐company and CDC‐sponsored publications that support their use. •	Know that healthcare is something you pay for; sick care is covered by insurance. Your insurance will pay for drugs and vaccines. •	Budget accordingly to stay healthy. Your life depends on it. When society gives into FEAR, any fear, it agrees to attack before it gets attacked. To vaccinate our bodies is to launch this attack against a made up enemy or an enemy that has not come yet to exist. And the after effects of such grievance are worse than that which we wanted to avoid. Just take a look at the state of the world today. Paranoia towards the future has led us to the most devastating of present times. The case in question, which has been kicking around for nearly two decades, was brought by Russell and Robalee Bruesewitz on behalf of their daughter, Hannah. In 1992 she began experiencing seizures after receiving a diphtheria, pertussis and tetanus shot made by Wyeth [part of Pfizer]. At the time, her parents tried to file a claim with that government-created system. Hannah has what’s called “residual seizure disorder.” Under the original setup of the government’s claims clearinghouse, she would have been covered no-questions-asked: Because of the difficulty in showing that a vaccine directly caused an injury, the government simply created a table of conditions that would be covered. But in March 1995—a month before her family filed their claim—a special government advisory committee gave the injury table a radical overhaul. Under the new system, residual seizure disorder no longer qualified a child for compensation. Instead, Hannah’s family needed to prove that the vaccine caused her injury, and they were unable to do so. This entry was posted in health, onlifemag, SELF and tagged Autism, do not vaccinate, health, healthy living, immunization, National Vaccine Injury Compensation Program, no vacunes a tus hijos, parenting, Pharmaceutical industry, Vaccination, vaccination is not immunization, Vaccine court, vacunas by onlifemag. Bookmark the permalink. 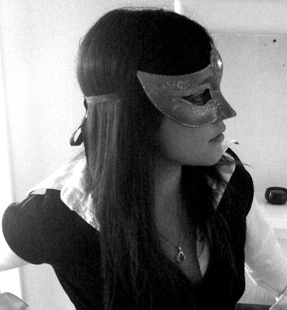 I’m definitely marking your blog as one of my ‘favourite’ pages! Thankfully, I don’t remember the last time I had a vaccine injection. But unfortunately, my family are not very open to holistic methods, despite the fact that we are Asian. Thanks! I do remember my vaccinations as a child…it was torture. At the time my parents conformed to the status quo and no questions were asked around health, politics and religion. Later on they both had a late adolescence and embraced new age teachings…fortunately for me I was also in my teenage years and together we discovered new ways of viewing and approaching life. Thank you for your kind comments and yes! It is important we remind each other of our flawless nature. I believe health is a state of mind and our birth right. The less we interfere with this natural process, the more chance we have to enjoy a long and healthy life and provide it to the ones around us.Thank you for reading.